Here's yet another AMV from me. The song that's in the AMV serves as the main theme to "Tenshi no Ryuu 2: Densetsu wo Jakunenmono", a crossover fic between "Nogizaka Haruka no Himitsu: Purezza" and "Yakuza 4" (or "Ryu ga Gotoku 4: Densetsu wo Tsugumono"). The cover at the end is done by me. But... I come bearing a crossover fic of "Nogizaka Haruka no Himitsu: Purezza" and "Yakuza 4" (a.k.a. "Ryu ga Gotoku 4: Densetsu wo Tsugumono"). 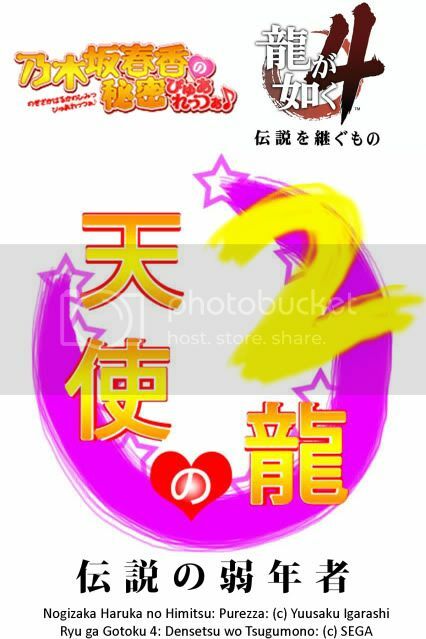 It's a straight sequel to "Tenshi no Ryuu" and starts two years after the events of the first fic I did in this series. Summary: Four former students of the Hakujou Private Academy make a difference in the dangerous red-light district of Kamurocho. Click here to begin that journey. The logo above is designed by me. Word Count: So far... 14,000+ words and counting. Warning(s): There is evidence of violence, language and suggestive themes. Author's Note: This is a crossover fic of the two universes, and I feel that they both do not have the popularity as it should. So... as a result, this fanfiction is born. You can read and review. This was actually fun to make, with the use of Photoshop, I tiled up icons of some the characters I'm using for my "Tenshi no Ryuu" series of fanfictions (the recent one being "Tenshi no Ryuu 2: Densetsu wo Jakunenmono"), gave the background a gradient, added Japanese text and... voila, a simple digital quilt. 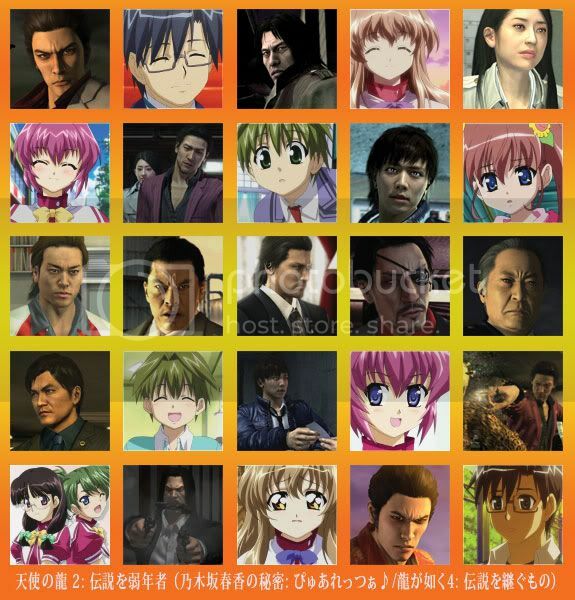 BTW, the Yakuza/Ryu ga Gotoku character icons are made by me. 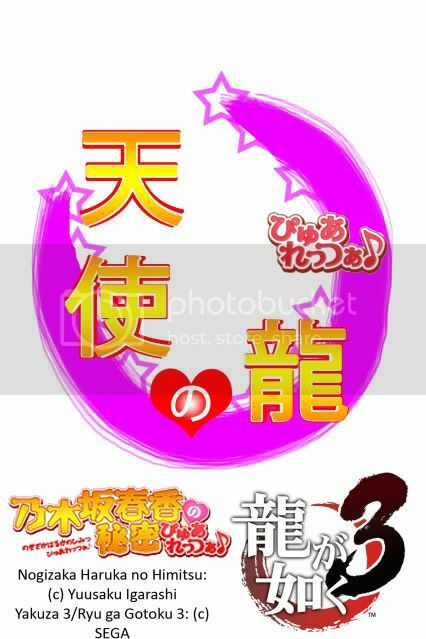 The Nogizaka Haruka no Himitsu icons are made by luinthoron. This is my first post, I'll make an introductory post soon. But... I come bearing a crossover fic of "Nogizaka Haruka no Himitsu: Purezza" and "Yakuza 3" (a.k.a. "Ryu ga Gotoku 3"). Summary: A journey of one young man from the Hakujou Private Academy saving his true love and becoming a legendary gangster in Kamurocho. Pairing(s): Mainly Yuuto/Haruka, but a slight hint of Yuuto/Shiina. Crossposted to hakujou_academy and necessarius. With only a few days left until the second anime series starts, I thought it might be a good idea to say a few words. First, of course, this would be my first time to greet you as your new moderator, although I've been this for quite a long time now. ^_^ Other than that, this is just a reminder to you to check the rules in the first post or the user info for what can and can not be posted here, and to try to avoid posting spoilers. Although seeing the level of activity this community has had in the past, I don't expect much beyond icon posts anyway. Or in less words, hello, and let's all continue getting along as nicely as we have until now! Alright, I hate to do this, but my interest in this series and community has waned. Since I don't want to delete this just in case there are fans interested in posting here, I'd like to open the floor to volunteers. If anyone's interested in taking up modship here, just comment and I'll hand it off your way. For those of you interested, some of the raw manga is available here.